BECKY HAS BEEN NOMINATED FOR HER FIRST DALLAS OBSERVER MUSIC AWARDS FOR “BEST FEMALE VOCALIST”. SHE’LL BE PERFORMING AT THE DOMA SHOWCASE DEC 1 IN DEEP ELLUM. Check out the Dallas Observer feature article HERE on Becky talking life, songwriting and where the two meet. BECKY HAS BEEN NOMINATED FOR four 2017 GHOSTY AWARDS & WON 3 INCLUDING Reader's & Ghosty's Choice for Best Digital Single & Ghosty's Choice for Best Song. Did you miss it? To listen to Becky's in-studio interview & performance, click HERE. 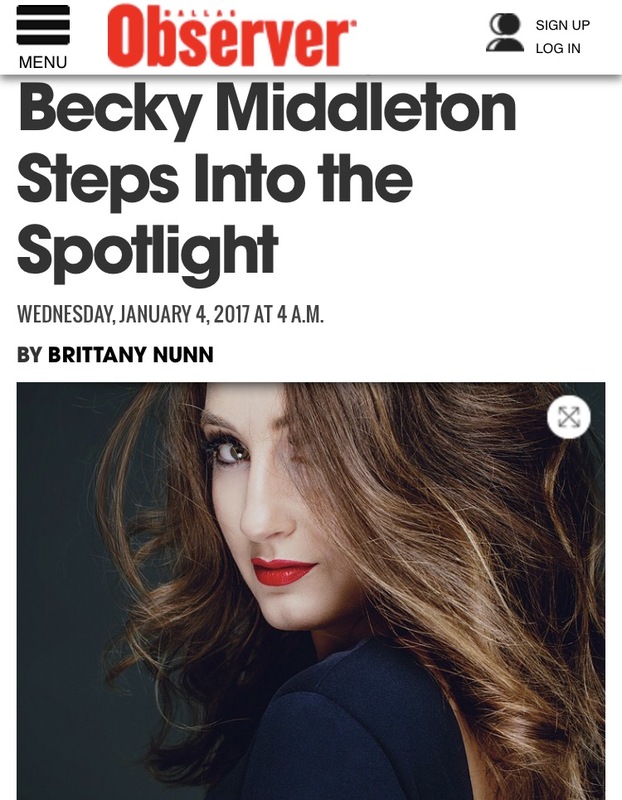 Becky's new single "I'm Still Here" was named one of Central Track's Top 100 Dallas-Area Songs of 2016. Becky's new single "I'm Still Here" from her upcoming record, Break The Fever, premiered December 5, 2016 on 91.7 KXT. For the perfect road mix, check out Becky's guest Spotify playlist on Culture-Hype #MusicMonday HERE. You can hear Becky featured on several artist's new album releases including Paul Cauthen (Have Mercy EP), Nicholas Altobelli (The Day-Olds EP), Ishi (Juno EP), The Warden (L-I-V-I-N), Sleepy Zuhoski, Brian Lambert (Country Music Jesus EP), & Misdemeanor (Give It Time), available now on iTunes, Spotify, & Soundcloud.